I loved going to the Burnhaven or Galaxy libraries as a kid. I’d stock up on all the Baby-sitters Club, Sleepover Friends and Sweet Valley books I hadn’t read. Sometimes I’d even branch out and choose something that wasn’t part of a series. In my later teen years, the library became a place I only went when I had a research paper due. And bookstores became the place to go for the latest books. 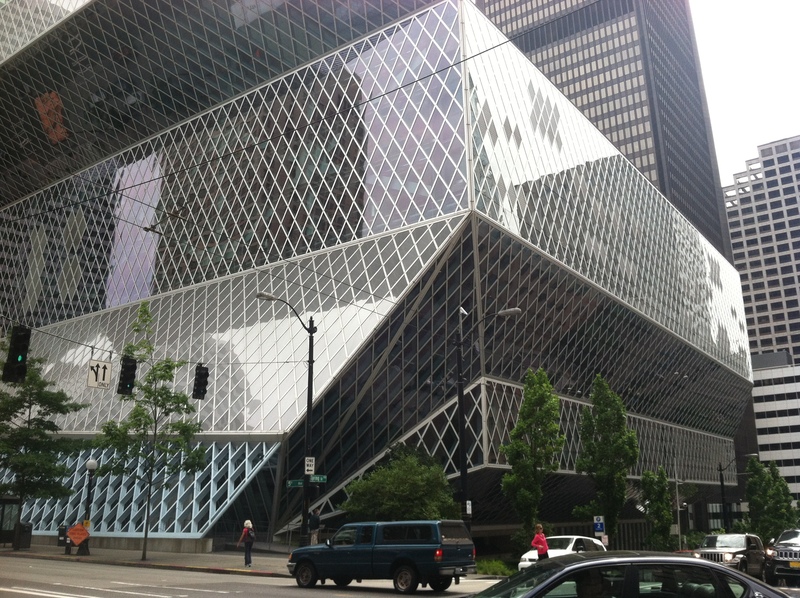 Seattle Central Library is modern inside & out. In an effort to get my budget back in line a few years back, I vowed not to buy anymore new books (with exceptions for gifts and textbooks that I couldn’t find used). In doing so, I rediscovered libraries and loved how modern they are. When I hear about a book that sounds interesting, I can just log into my account and place a hold. When the book is available, it’ll get an email letting me know my present, I mean book, is ready for pickup. Sometimes I go crazy (like last week) and place holds on bunches of items at once. And I get those emails back-to-back. I was just picking up at the Morningside branch yesterday and another goodie came in today! If I could just offer the NYPL one little suggestion: The Seattle Public Library organizes hold books by last name. This was hugely convenient. I memorized my last name decades ago. The NYPL organizes theirs by last four digits of the library card number, which I don’t know as well as my own name. So, there I am fumbling through my wallet for my library card only to remember it’s on my key chain. I give my bag a shake and hear my keys, but can’t locate them. I consider dumping the contents of my bag on the floor when I finally locate them. I take my present, I mean book, home.